To make this handbag cake, I bake a 8x8 square cake and cut into half, and stack on top on one another by filling with buttercream. Secure it with long satay stick. Frost the whole cake with buttercream, chill for an other and smooth the surface. Pump the logos with buttercream. Then can start to do the decor on the cake. All decorations are made of fondant. 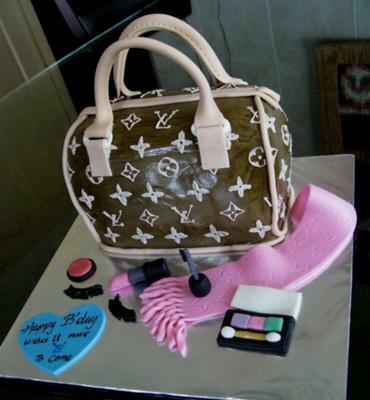 I love it, are the handles made out of fondant?